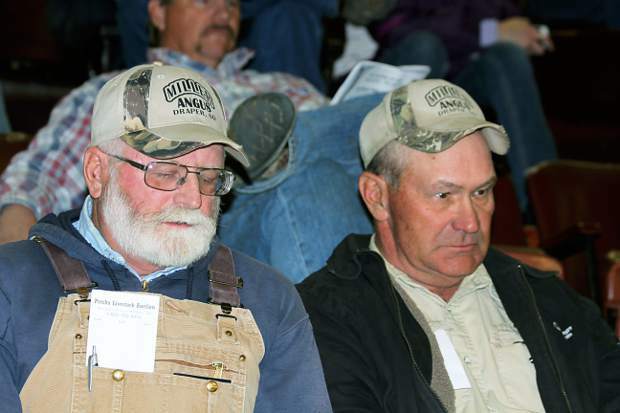 Paul Patterson and Kevin Meyers, Draper, South Dakota: Paul bought Lot 40 at $ 12,500. Kevin purchased Lots 41 and 446, each at $9,000. Presho Livestock hosted a nice crowd for the Miller Angus Bull Sale. Curt and Janet Miller, along with their son, Casey Miller, have been involved in the Angus business for a long time, but 2015 proved to be the best sale ever for this well-respected family. This was a good, uniform set of bulls. They were long-bodied and were bred to provide a lot of growth and quality to their calves. The catalog had comprehensive data on each of the bulls. Gains and productivity factors were right there for comparison. You will find pathfinder status in the backgrounds of a number of the mothers of these bulls. Many repeat buyers were on hand, and that made for a very competitive sale. Top selling bull of the day went to Paul Patterson, Draper, South Dakota, with his final bid of $12,500. Lot 40, MA Identity 40, was a powerful bull, extremely long, deep, and wide. Born at 95 pounds, he weaned at 756 pounds and grew to a yearling weight of 1518 pounds. He had gained 4.67 pounds per day. Sired by Koupals B&B Identity 2035, he was out of a TC Broadside 724 daughter. His EPDs included BW 6.7, WW 72, YW 126, MILK 31, and $B 110.05. Folks also were anxious to bid on Lot 415, another son of Koupals B&B Identity. Eric Iverson, Murdo, South Dakota won the bid at $11,000. Out of a daughter of Bon View New Design 1407, he had an 86 pound birth weight, a weaning weight of 720 pounds, and a yearling weight of 1347 pounds. His rib eye was 14.3 sq. in. and he had a 39 cm. scrotal measurement. His EPDs were BW 2.8, WW 60, YW 108, MILK 36, and $B 121.30. His weaning and yearling weight ratios were 112. I counted four bulls at $9000 each. Lyle Hullinger, Vivian, South Dakota, purchased both Lots 422 and 447. Lot 422 was again out of Koupals B & B Identity. His dam was a daughter of Connealy Banker 774A, and he was 86 pounds at birth. He weaned at 640 pounds and posted a yearling weight of 1275 pounds, gaining 4.16 pounds per day. He had EPDs of BW 2.6, WW 60, YW 113, MILK 28 and $B 121.36. Also at $9000, Lot 447 was sired by AAR Ten X 7008 SA and out of a Schurrtop MA Broker 6786 daughter. Born at 74 pounds, he knew how to grow as he reached a weaning weight of 693 pounds, and a yearling weight of 1339 pounds. After gaining over 4 pounds a day, he scanned a 13.2 sq. in. rib eye and an IMF of 4.26. His EPDs were BW 1.8, WW 69, YW 125, MILK 22, and $B 116.59. Kevin Meyers, Draper, South Dakota, wanted high quality bulls, and he found them when he paid $9000 each for Lots 41 and 446. Born at 86 pounds, Lot 41 was out of Koupals B&B Identity 2035 and out of a daughter of TC Broadside 724. He weaned at 692 pounds to ratio 108. Along with an IMF of 4.29, he had EPDs of BW 6.1, WW 73, YW 122, and MILK 29. Lot 446 was sired by AAR Ten X 7008 SA and out of a daughter of VAR Rocky 0114. This heifer bull prospect was born at 70 pounds and weaned at 704 pounds. His IMF was 4.27. His EPDs were BW 1.5, WW 75, YW 130, MILK 23, and $B 111.00.